Patricia Cunningham and Debra Renner Smith help close the literacy gap and achieve academic success for all students with Beyond Retelling: Toward Higher Level Thinking and Big Ideas! To meet today's educational demands, Patricia Cunningham and Debra Renner Smith present teachers with a framework based on years of reading research to help students attain higher level thinking skills and develop their ability to think critically about what they read. Their "Thinking Theme" lesson framework allows teachers to pose "The Big Question" and support students as they think about "The Big Idea." With the guidance of Pat and Deb, teachers will find their students will be able to formulate thoughtful answers to the big question and will move from proficiency to literacy achievement. Reviewers Can't Put This Book Down! 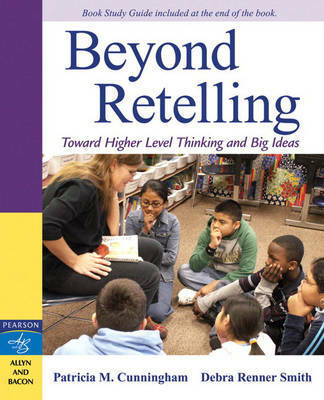 "In an era of phonics-based instruction, especially for students in poverty and English Language Learners, it is refreshing to see a balanced view of what good reading instruction can look like...Additionally, the lessons described in Beyond Retelling demonstrate that all students are capable of deep thinking about their reading...Beyond Retelling is a phenomenal book." -Sheila Bostrom, Thomson Elementary, Brush, CO "The authors have done an amazing job and have hit upon one of the biggest issues confronting teaching reading today. In a time when teachers are pressured to cover material at a lightening pace, higher level thinking skills are not being taught as they should. This book reminds us that we should be creating critical thinkers and lifelong learners..." -Pam B. Cole, Department Chair, Kennesaw State University This book will become a must-read for any teacher whose state requires students to be evaluated on the higher level thinking processes of synthesis, analysis, evaluation, or application as they move through elementary and middle school!